I stick by my predictions that this was going to be brave and honest. And it was! I sat on my back porch, sun streaming down on a glorious afternoon reading All the bright places. Finch and Violet meet at the top of the school tower, both of them overwhelmed by a sense of deep, dark despair. From that meeting, while it takes a bit of time and negotiating, their relationship grows and I felt myself smiling as I was watching a young couple fall in love. Both have things they need to deal with and bit by bit things begin to change. Finch forces the situation and they are teamed together to work on a school project. He manages to encourage Violet to step well out of her comfort zone as they travel outside of the safety of their small town as part of the project’s requirements to find the natural wonders of their state. But as Violet’s world opens up, his world becomes more and more difficult to cope with. By the end of the book, I was still sitting on my porch in the sunshine, but tears falling (hoping the neighbours didn’t hear) feeling I just wanted to reach out and hug them both. Mental health issues, especially for teenagers is often a taboo subject but it shouldn’t be. We need open discussions and we need to not be afraid to talk. Finch and Violet are both broken people, both needing help but not knowing where to turn. There is hope, always hope but sometimes, like Violet, you need to be shown where hope hides and find all the bright places. 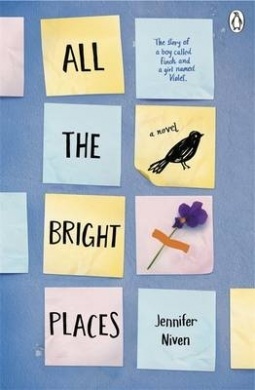 Very moving, thought provoking YA novel. Check out the great trailer for this book posted earlier right here. 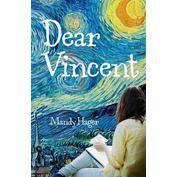 Much like Mandy Hager’s Dear Vincent in an earlier post I applaud authors of YA fiction for bringing us such poignant novels. Again, if you need help or know someone who does, please don’t hesitate to ask someone. There are agencies to call, and teachers at school who will listen. Reach out! I must say I have not read this novel but have been following its build up and it is high on my list to buy and read. I am in two minds though, as I can’t wait to see how this book about Violet Markey and Theodore Finch plays out but I am almost afraid to read it. In the space of 12 months 4 young men I have known have all tragically taken their lives. However, we can not hide the fact, that teen depression and mental illness exists. We can not ignore the damage and impact these illnesses have. So yes! I want to read this book but no spoilers please. I want to find out for myself how it all ends. From the publisher’s web site because their blurb says it best. “Theodore Finch wants to take his own life. I’m broken, and no one can fix it. Violet Markey us devastated by her sister’s death. In that instant we went plowing through the guardrail, my words died too. They meet on the ledge of the school bell tower, and so their story begins. It’s only together they can be themselves . . .
You’re so weird, Finch. But that’s the nicest thing anyone’s ever said to me. I commend the publishers who have made the following announcement as part of their publication details. Please be mindful whom you recommend this book to. It is not for everyone. Those that it is for, will no doubt love it for its honesty and bravery. Tara is 17 and overwhelmed by what life keeps throwing at her. She is trying to succeed at school, working part-time to help out at home as well as caring for her stroke-ridden father. Her mother is brutal, uncaring and abusive. Tara misses her older sister, Van who died five years ago and consoles herself with painting. She is obsessed with Vincent Van Gogh seeing parallels between his life and hers. The discovery that her sister had actually taken her own life leaves Tara distraught. She begins to spiral out of control desperate and self-destructive. There is hope though in the companionship of an elderly man she cares for at the rest home where she works. He offers her strength and wonderful discussions about Vincent Van Gogh. But is it enough? This book is raw and honest. Family secrets are hidden deep but the consequences are devastating. It is an emotional roller coaster which leaves the reader gasping for breath. Suicide is very real and Mandy Hager is brave to tackle what is often a taboo subject. I highly recommend this book although the subject and reality of suicide is not for everyone. I predict this gutsy novel will be a finalist on next year’s New Zealand Post Children’s Book Awards. Jem Halliday has always been in love with her best friend Kai despite the fact that he is gay. It is their secret. It is not the way she wants things but she copes and remains his best friend. However, someone outs Kai online and he is so distraught he kills himself. Jem knows nothing will bring him back but she sets out to find out who is responsible. Jem wants revenge and payback for the loss of her best friend. But perhaps Kai had other secrets! Love, revenge and betrayal! What a mix! I do so want to read this.